When it comes to visual symbols of the United Kingdom, they are often representative of the fact that the UK is a union for four nations that have come together as one country over the centuries and to reflect particular aspects of each part of the Union. This is no different with regard to the new pound coin and the new Team GB athletic kit for the Summer Olympics in Rio de Janerio this year. First up, the new pound coin is currently in production and will start circulation in March 2017. They will be replacing the popular round coins, which have been in production since 1983 and were themselves designed to replace the one pound note. In contrast to the round pounds, these new coins will be 12-sided – which makes them resemble the old pre-decimalization threepenny bit – to better guard against sophisticated counterfeiting. Over time, the vulnerability to counterfeiting has resulted in 45 million phony round pounds flowing through the money supply, or three coins for every 100 in circulation. Aside from this, the round pound was known for the versatility in the design of its reverse side – with representations of the country as a whole, as well as prominence given to one of the constituent parts of the UK in a fashion similar to the state quarters in the United States. For the new pound coin, its obverse will feature a portrait of Her Majesty the Queen, as indeed all coins do. On the reverse, it will continue in the tradition of symbolizing the UK by featuring the country’s floral emblems: the Tudor rose for England, the thistle for Scotland, the leek for Wales, and the shamrock representing Northern Ireland. Each of the emblems are “grown” from the same stem and fitted into a Royal coronet, which symbolizes them being united together into one sovereign entity. This inaugural new coin displays a symbol of national unity in the UK by linking the emblems of its constituent parts together in a fashion that is simple, but powerfully symbolic on something which every Briton will use. Meanwhile, the new Team GB athletic kit designed by Stella McCartney features uniforms which most Britons will likely not use, but they nevertheless contain the sort of symbolism which shows unity out of diversity for the UK. Some of you may remember there was some dissatisfaction over the lack of a Union Flag in the kit for British team at the World Athletics Championships. Not so this time, for the 2016 Olympics kit features the Union Flag quite prominently, and unlike the stylized and “modern” Union Flag from four years ago, this one uses more of the actual colors from the flag itself. Indeed, as the Telegraph’s Emma Spedding and Bethan Holt noted, McCartney – who also designed the 2012 kit – went against the minimalist approach with different hues of mostly blue and geographic shapes from last time, and instead went for a “focus on bold logos and patriotic emblems.” As a result, there is a splattering of red, white, and blue throughout the apparel being used by all 600 British Olympic and Paralympic athletes, and they are further linked by similar logos, GB embroidery, and a new coat of arms. The coat of arms is probably the most striking feature of the kit; they were specially commissioned by Adidas via the College of Arms, who designed them for use on just about everything for the British Olympic Association and British Paralympic Association from 2016. At their heart is a shield which features the floral emblems of the UK – England’s rose, Scotland’s thistle, the leek for Wales, and the flax (as opposed to shamrock) for Northern Ireland, which are all linked together by four central chains representing the four years of an Olympic cycle. 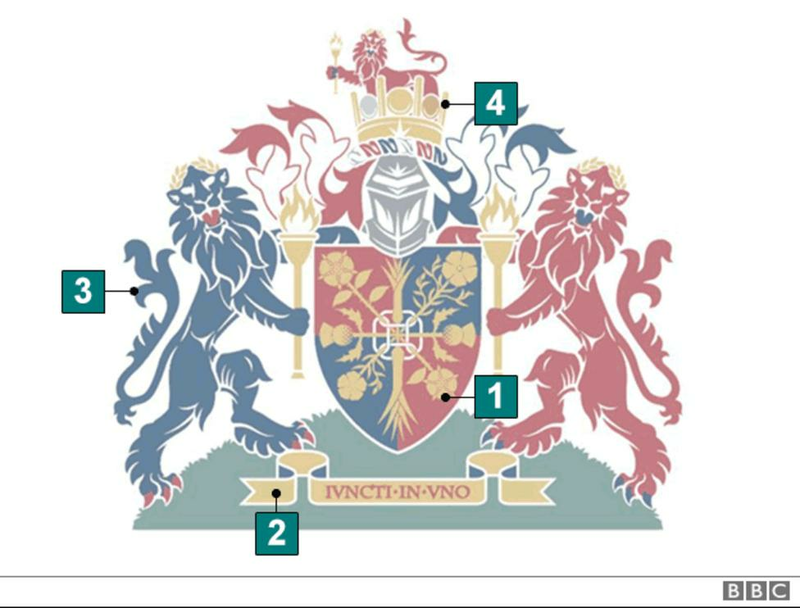 On either side supporting the shield are lions, which symbolize strength and athleticism, and are regularly seen on various UK iconography at home and abroad , and they hold Olympic torches and are crowned with the Olympic laurel wreaths. Atop this is a crest containing a smaller lion holding a torch within a crown of gold, silver, and bronze medals, with relay batons between them to represent teamwork, continuity, and shared responsibility. Along the bottom is the Latin motto IUNCTI IN UNO, meaning “Conjoined in One”, which refers to the separate Olympic sports, the Olympic and Paralympic teams, and the four UK Home Nations competing together as Team GB. It is very much a more traditional look set against these uniforms which are certainly in the 21st Century, but of course, this is what Britain does all the time – honoring tradition while adapting to current needs and looking to the future. This is symbolized, along with the fact that England, Scotland, Wales, and Northern Ireland are all critical to making the UK what it is – a multinational nation-state which celebrates the cultures of its various parts, which in turn contributes to the overall culture and society of the United Kingdom has a whole and the concept of being British. Indeed, without the sum of its individual parts, there can be no Britain, and the symbolism of the new Team GB kit shows the UK is not just about England, or London, or [big, bad] Westminster, or the [evil] Tories. There is a social, cultural, and perhaps even, a spiritual element to the UK that I believe gets lost in the debates about the constitution, the Barnett Formula, and etc. It was that element of the UK that was truly in danger two years ago, and continues to be at risk – that element which helps to bind the people together into one as they fuse into a common culture with shared values and beliefs, and participate in many of the same things, while also maintaining the elements that make them distinct from each other. We saw this four years ago during the Summer Olympic Games on home soil in London as Scotland’s Sir Chris Hoy led Team GB during the opening ceremony with the Union Flag in hand. He would go on the become the UK’s greatest Olympian and so many others who followed him that night set new records and achieved so much for themselves and their country over the next several weeks as the Games were underway. We shall see it again this year when Team GB heads to Rio. London 2012 heptathlon gold medallist Jessica Ennis-Hill, who will be competing in her second Olympics this year, was among the Team GB athletes who took part in the design process and upon the unveiling of the kit, she remarked that it was "an amazing design and I think it will give British athletes a massive sense of pride and give us an edge in Rio." Indeed, this year's kit is 10% lighter than last time around, so it is hoped that the edge which Ennis-Hill speaks of will be functional as well as aesthetic. In this regard, it was swimmer Tom Daley's rather small trunks which got much attention, but he insisted that it was all about getting the best result possible. Daley, who also had a hand in the design, further stated stated his belief that the 2016 kit is "going to be iconic" in terms of being than 2012 and expected the coat of arms to be use in future competition for Team GB. All of this is a real-life display of the symbolism contained within the new pound coin and Team GB kit – that while the UK is made up of different parts and its people have multiple identities, they also come together as Britons to fuse their individual talents into a national synergy which paves the way for the achievement of great things like the incredible medal haul at London 2012 and in this year, may result in Team GB winning more Olympic medals away from home than ever. It certainly shows that Britain is hardly a clapped-out and washed-up former imperial power; her old Empire has been successfully transformed into the Commonwealth, and the country itself had carried on in modern times. It still has much going for it when the people believe in themselves and are willing to join together in common efforts to advance the country and themselves; objects such as the new pound and the Olympics kit act brilliantly as powerful symbols of this unity and togetherness.